Registering a trademark is an essential step for any business owner regardless your business’ size, location, or product or service. Trademarks protect your reputation and your ownership of the distinctive words and marks that make your business unique. Here are the top five things you need to know about trademarks. 1. The definition of a trademark. A trademark is a word or a combination of words, sounds, or designs that are used to distinguish your goods or services from other companies. For example, Nike’s trademarks include the “swoosh” design and “Just Do It” slogan. Trademarks should not be confused with other forms of intellectual property, such as (a) copyrights, which provide protection for literary, artistic, dramatic or musical works; (b) industry designs, which are visual features of shape, configuration, pattern or ornament, or any combination, which are applied to a finished product; or (c) patents, which apply to new inventions or any new and useful improvement to an existing invention. 2. A trademark protects your brand. Owners go to great lengths to brand their business. A trademark protects that brand. Your trademark identifies your goods or services in the public’s mind and how they are perceived in the marketplace. Your business’ success depends almost entirely on the message you convey, and the image you project. Your trademark helps you establish a presence and enables you to stand out from your competitors. People tend to be drawn to familiar names and designs if they are associated with quality and reliability. Take Disney for instance. 3. Registering your trademark is important. Trademarks provide legal entitlement to intellectual property. Registration of a trademark is direct evidence of ownership. This means that in a dispute, the other party will have to prove actual ownership of the mark, or prove that its trademark is distinctive and will not cause confusion for the public. A registered trademark provides the exclusive use of the trademark across Canada for 15 years, and is renewable every 15 years thereafter. Registration also helps prevent competitors from selling essentially the same products or offering the same services under a similar trademark, so the public won’t confuse your goods with your competitors’. Take for example a lawsuit filed in 2013 by Canada Goose against Sears. According to Canada Goose, Sears is selling lower quality “knock-offs” of its high-end Kensington jacket. According to Canada Goose, the Sears Alpinetek jackets are so similar that at least one consumer has mistaken the Alpinetek for a Kensington. Both jackets are red, 3-quarter length, have fur-trimmed hoods, and have circular logos on the top of the left arm. The logo designs are different apart from being circular, as shown below. 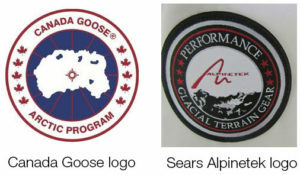 In response, Sears noted that its brand was quite distinct from Canada Goose’s, and that many brands use circular logos, which Canada Goose could not claim it invented. Do you think the logos are similar enough in the circumstances to constitute trademark infringement? 4. Know the difference between trademarks vs. trade names. It is important for business owners to understand the difference between trademarks and trade names. Trade names are names under which a company runs their business. A trade name can only be registered under the Trade-Marks Act if it is also used as that business’ trademark; that is, to identify its goods and services. If a business uses an unregistered trade name, and another business subsequently applies to register a similar trademark, the registration may be opposed. Even if the trademark becomes registered, the other company may file a lawsuit asking the court to strike it. An example of this potential issue is illustrated in the case Woodpecker Hardwood Floors (2000) Inc. v. Wiston International Trade Co.. Woodpecker Hardware was granted an interlocutory injunction preventing Wiston from using the word “woodpecker” when selling products, until the Court had made a final decision on the matter. Wiston unsuccessfully appealed the injunction. Both companies sell hardwood flooring products. Woodpecker Hardwood had used the trade name “Woodpecker” from at least 2000. It did not register “Woodpecker” as a trademark. Wiston was incorporated in 2009 and operated as Wiston until 2013, at which time it registered logos, insignia, and word marks, some of which contained the word “woodpecker”. Woodpecker Hardwood sued Wiston for “passing off, or attempting to pass off”, their products “in such a way as to cause confusion between their wares and services and those of [Woodpecker Hardware]”. Woodpecker Hardwood also sought a declaration that Wiston’s trademark was invalid. As of the date of this article, the matter was still ongoing. 5. It’s Important to know the process, and where to find help. The very first step any business owner should take when preparing to register a trademark is to conduct a preliminary search through the Canadian Trademarks Database. The search will help determine whether your trademark could cause confusion with one already registered. According to the Canadian Intellectual Property Office (“CIPO”), some factors to take into account include (a) whether it looks or sounds like, or suggests a similar idea, to other trademarks; and (b) whether the trademarks are used to market similar goods. Trade names may be recorded separately in each province under provincial registration; therefore, there is no central inventory containing all current trade names. These searches may be complex, and use of a registered trademark agent is recommended. Once your preliminary search is completed, you may submit your application to CIPO. Various fees apply throughout the process. Once CIPO has received your application, it will be reviewed. You may be asked to provide additional information. Once the application process is completed, CIPO will acknowledge receipt of your application and will assign a filing date. This date is important in the event of a dispute, as it may be used to determine who sought registration first. Your application is then added to the Database as a pending trademark. The next step is an examination by CIPO of your trademark to determine whether there are any conflicts with existing or pending trademarks. Your trademark is also examined for compliance with the requirements set out in the Trade-marks Act. CIPO will publish your application in the Trademark Journal, leaving time for opposition, or challenges, to your application by others. If an opposition is submitted, there will be a determination by a CIPO officer. If no opposition is filed, your application is allowed and your trademark is registered. This is a simplified explanation of the process. To learn more and obtain assistance, please refer to CIPO’s Guide to Trademarks. Please note: This article is for information only, and should not be relied upon. It is not intended to be legal advice, nor is it a substitute for legal advice. Every situation depends on its circumstances. The law changes rapidly and often without notice. If you have a question or concern, you should consult a lawyer or registered trademark agent. As the new year arrives, we look inwards and with the best intentions, resolve to stop, start, do more, do less or better. Inner reflection is not limited to us personally but is applicable to our businesses as well; it’s as good time as any to take an inventory of how your business presents itself to the world. While there are many public-facing aspects of your business, your logo is the foundation and it needs to be strong to stand up to the task. Here are five quick questions you can ask yourself to test how well your logo measures up. Is your logo simple and easy to understand? Your logo needs to be simple enough that a viewer can instantly understand it should they only get a fleeting glance of it off vehicle graphics or a passing road sign. Complicated logos can be hard to comprehend and detailed logos may experience output problems if printed too small. Does your logo fit your industry’s visual conventions? Some industries have a certain look associated with them; most financial organizations use conservative colours and serif fonts where as fast food restaurants use trendier fonts and bright colours. Over time, these similarities have been engrained in our subconscious as the norm. If a business doesn’t fit our expectation of the norm, we instantly become wary. Some organizations defy this convention successfully and if your organization can pull it off, it will reap the rewards of standing head and shoulders above its competition. It may be a long and expensive road however, with significant marketing required to remind your viewers of your organization’s amazing capabilities, despite its unorthodox appearance. How many versions of your logo do you currently employ? Do you have a website displaying your new logo but you’ve got a box of business cards you want to finish up before ordering more with the new logo? If so, stop right now! Different logos confuse your viewers and will water down your brand. How timeless is your logo? Was your logo created in 1994? Does it look like it was created in 1994? Unless you’re selling antiques, it’s more important now than ever to ensure your business looks up-to-date, knowledgeable and trustworthy. Your customers want to know that your business is current and they will assume so if your logo reflects this. A simple logo usually means a long-lasting logo. Timeless fonts like Helvetica and Avenir and simple illustrations will stand the test of time. The Nike swoosh was created in 1971 and the Coca-Cola logo is over 100 years old. Your logo is the foundation on which your brand is built and if it’s done right, it will nest itself neatly in your customers’ minds forever. How much is that real estate worth to you? Don’t underestimate the value of your logo. We’ve all been there; we’ve all started businesses and we know how hard it can be to decide where to spend that precious and very limited start-up capital. There are two schools of thought when it comes to marketing your new business. Start small and build as you go, or burst onto the scene and get the jump on your competition. The first scenario is chosen more often because many new business owners fail to see the big picture value of this investment. Are there advantages to both scenarios? Absolutely, but consider this. A weak brand can negatively impact your company—it may not show your credibility and could fail to inspire the necessary confidence a new customer may need to make the decision to use your business. In addition, your organization will require a very costly rebrand later on down the road which may leave your customers confused and wondering what’s going on in your organization. None of these are scenarios you want your customer to associate with your business. While investing money in the visual aspect of your business requires a significant up-front investment, its value far exceeds its cost. Maximize your investment by choosing only the most important materials you need to market your business right the first time and do the rest later. To help you with this decision, we’ve created a list of what every start-up business should have. Seems like a no brainer, right? Contrary to popular belief, less can sometimes be more when it comes to logos. Some people are confused into thinking that everything about their business needs to be portrayed in their logo. That is ideal, but definitely not required. Most importantly, your logo needs to be strong and easy to understand. If your logo is on a road sign or a vehicle graphic, it needs to be simple enough that a viewer can instantly recognize and understand it, should they only get a fleeting glance. In addition, detailed logos can experience potential output problems, for example, fine details may become indistinguishable when the logo is shrunk for a business card, web banners or embroidery, etc. Think of some of the biggest brands out there and chances are their logo is very simple. Apple, Nike, McDonalds, Staples. These are all very simple logos. Jeep, FedEx, Disney are all wordmarks, meaning it’s just a word. The simpler your logo, chances are it will never go out of style, saving you mucho deniro on expensive rebranding costs five or ten years down the road. Despite the popularity of social media and online networking, your business card will always play a significant role in your organization’s advertising strategy. Your business card is often the first piece of advertising your customer will see and from it, their first impression of your organization will be made. What kind of an impression do you want to make? Your business card is more than a way to neatly distribute your company information. How often do you have a potential client giving their undivided attention to your business? Maximize this opportunity and make a meaningful connection with your customer. Give them more than just your phone number and your website address and tell your customer about what your organization does and how it can solve their problems. As the number of people doing research online before making purchase decisions continues to climb, it is imperative that your organization has an online presence. Consumers want to check prices, learn about who they can buy from and what their policies are before picking up the phone or driving to the store. 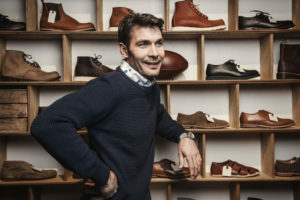 Why a customer should deal with you and why your business is better than the competition. Your products and services and how they solve your customer’s problems. Depending on who your customers are, it may be worth the investment to add other elements like instructional videos on how to use your product or e-books on other ways customers could use your product. You may want the site to collect email addresses for a newsletter down the road. There is no limit to what your website can do, it’s just a matter of budget constraints. Remember, if built properly, you don’t need to do it all at once. Start with a basic site now if that is what the budget permits and add more features as time goes on. For many businesses, a Facebook page is also expected. While some types of businesses may do better on Facebook than others, it is another platform where you can get in front of your customers—for free—and build brand recognition. Remember, using Facebook to promote your business is different than other methods. People go to Google to find something, whereas Facebook is a social experience. A hard-sell on Facebook would be viewed by your customers as you going to a party in sales-mode. Nobody wants to be pitched to at a party. A postcard, rack card or brochure is a great leave behind piece that is relatively cheap and if done properly, can be a remarkable advertising tool. The more innovative, the better. Forget the tri-fold brochure and go with something different and unique, but keep your content short and to the point. Talk about the high points of your business. How can you solve your customer’s problems and what makes you better than the competition. You can leave these behind at sales calls, hand them out at network events or tradeshows. Talk to other businesses where your services complement each other and see if they’ll hand them out for you. Are you a caterer? Mail some to local event planners. Are you a photographer? Mail some to wedding organizers. Spending wisely is important when starting a business but marketing is not the area to cut corners. The money spent on these five items will be returned repeatedly. These items transform “a job you do” into an entity unto itself with a look and personality; something your customers can see and trust. How many sales would you have to make to recover a $3000-5000 investment in these items? Probably not as many as you think. On the flipside, how many people could potentially be turned away by a weak brand or the uncertainty of whether or not your business is up to the task? Humans are very visual and as much as we like to think otherwise, the book does get judged by its cover. Having a strong brand speaks volumes to the credibility and abilities of your business. Without that, you will have to spend more time and work much harder to convince your customers that they should do business with you. Invest in a proper brand and let it do the work for you. Despite the popularity of social media and online networking, the business card will always play a unique role in your organization’s advertising strategy. At trade shows, meetings or networking functions, business cards are the easiest way to communicate not only your organization’s contact information, but a snapshot of your organization. It’s a 3.5″ x 2″ elevator speech your customer keeps. Your business card is often the first piece of advertising your customer will see, and from it, their first impression will be made. Is your business card up to the task? Using your card as only a vehicle to distribute your company information is like buying a Ferrari and never taking it on the highway. Unlock the potential of your business card and use it to make a meaningful connection with your customer. Give them more than just your phone number and your website address. Take these precious moments of undivided attention and tell your customer about your organization. Your business card tells a story about your business, and it’s not just the words printed on paper that have a tale to tell. The design, the paper, the fonts and the finishing all speak for your business and it’s in your best interest to control what is being said to avoid conflicting messages. Gone are the days when strolling up to the counter at your nearest Copy/Print store for the $99 1-colour business card special was good enough. The cost of quality printing and finishing has dramatically dropped in recent years and now attractive, professional business cards are within the reach of organizations of any size. The trick is to know what to look for. Read further and you will too. This may seem obvious, but take a moment to think about where your organization is, and where it will be. For some organizations, it takes a while to go through 500 business cards. Are you moving soon? Maybe don’t put an address on the card if it can be found on your website or invoice. Make sure you get it right the first time. Pulling that first card out of the box and realizing you forgot your phone number is a real pain. Proofread, proofread and proofread again. A business card is like a meal. A bland business card, much like a peanut butter sandwich eaten over the sink, is unremarkable and in no way memorable. If your card gets handed out at an event where many cards are swapped, for example, a networking event or tradeshow, chances are your card will be in many pockets that also contain the cards of your competition. If your card is confusing, plain or unremarkable, your card will likely end up at the bottom of the pile, or worse, filed under “G”. Much like an evening of great food, fine wine and great conversation, a stellar business card will stand out in a reader’s memory. If your organization has an existing look and feel, design the cards to be consistent. Advertising materials consistent in appearance increases the value of your brand and reinforces your organization’s message in the memory of the reader. How your organization’s card should be laid out could be influenced by your industry’s visual conventions, but for some it’s a blank canvas. A tattoo artist could have an elaborate, colourful illustration or something simple as a black card with a name and contact information. You would be a hard pressed to find an accountant with a card that looks like either of those, opting instead for something more conservative. We’ll save the design theory for another day, but make sure your design is cohesive and attractive. Your card could be on the most expensive paper available, but if the design is unprofessional, there is no value. If you’ve got the space, use it. Within moderation of course. Many people leave the back side of the card blank. Use this empty space to show your mission statement, your top products or map to your office. Add a QR code to your card and bridge the gap between the real and virtual world. You’ve got your viewer’s attention; make this a moment your viewer will remember. Take advantage of their attention and drive your message home. The stock, or paper you choose for your business card can make a strong statement. The standard, thin, white card stock is over used and unremarkable. It’s flimsy; it doesn’t wear well and looks cheap. There are more paper options than ever before, and they won’t break the bank. A thick, 16pt stock is thicker than average card stock. It stands out; has more substance. A thicker stock implies quality and will project strength and trustworthiness onto your business. 24 pt stock is very thick and would be worth looking into your product or services are high-end. Its expensive feel implies exclusivity and luxury. Make sure the paper you choose sends a message appropriate to your organization. A 24 pt paper would be the wrong choice for a charitable organization; the message it would send wouldn’t be congruent with most charitable goals; it would seem extravagant and a misuse of funds. If your organization is environmentally conscious, a recycled paper would convey that. Fonts have personalities unto themselves, and choosing the right font is paramount to reinforcing your cards design and message. While there may be millions of fonts available, most of them will not be appropriate. Fonts can be too trendy, to boring, to serious, to happy, to subdued, to professional, not professional enough…etc. Most organizations have, or should have, a logo made prior to printing business cards and it’s possible that your fonts may be dictated by your logo. While the font in the logo may not be the font chosen for the card, choosing a font that compliments it will narrow your options significantly. Keep your industry’s visual conventions in mind. KFC would probably not use Time New Roman any more than a nursing home would use a graffiti font or a lawyer choosing Comic Sans. Avoid trendy fonts. Trendy fonts will date quickly. If you have many different people in your organization with business cards, if you switch the font for one person, you need to do it for everybody. Limit the number of fonts. Using too many fonts will make your card appear unprofessional. Keep the fonts consistent among items of the same priority. Your phone, fax and email should stay the same font. Choose fonts because they are appropriate to the message, and not because they are your favourite. The fonts you chose should be chosen because they enhance the card and your message, not because they’re cool. When in doubt, use Helvetica. If you can’t choose a font, just pick Helvetica. There is not a business in existence that Helvetica would not be applicable to. Like fonts, some of the colours you use may be dictated by your logo, but rarely must you exclude others. Business cards don’t need to be just white paper with text on them. Adding a background image, imagery that supports your message, repeating backgrounds are all ways to take your card your card from boring to brilliant. There are many different finishing options available that have become more affordable in recent years. Rounded Edges add a degree of class and attention to detail. Round 1, 2, 3 or all 4 corners for a unique, polished look. High Gloss cards stand out like a shiny new watch. They’re eye-catching, attractive, and they look sharp. Spot UV cards are like high gloss, except the high gloss is confined to certain areas. Spot UV adds a level sophistication and elegance to even the simplest of cards. Embossing, raised ink, custom die cuts are all options available to make your card stand out in your viewers memory with a price tag that isn’t as high as one may expect. Be clear. What your business does and the message need to be abundantly clear. Not enough, too much or conflicting information reflects disorganization onto your business. Be legible. Nobody keeps magnifying glasses handy and if your reader needs one to read your phone number or website, chances are they’ll flip to the next card, and flip yours into the trash. Use a standard size. If your card doesn’t fit neatly into somebody’s card holder, you run the risk of getting tossed for the sake of simplicity. Recycling and reusing isn’t cool for business cards. If you move or change your phone number, don’t put a label over the old info, or worse, don’t cross out the old info write the new info above it. Plan ahead. Look like a professional. An unprofessional design will project the same unprofessionalism onto your business. Have your cards professionally printed. Business cards printed at home look like business cards printed at home. Perforated-edges, banded ink lines and the inaccuracy of home printers will imply your organization is run out of a basement. Don’t let the feeling of accomplishment skew your objectivity. Stand out from your competition. If a shopper at a kitchen and bath trade show gets a business card from five cabinet builders, will they call the builder with the black and white card with clip art, or will the call the builder with the shiny card with a picture of a dream kitchen on it? The strength of your business card is key to reinforcing the credibility and the message of your business. You wouldn’t show up to a sales meeting in your pajamas, so why would you want your business card to look equally unprofessional? Dress it to the nines, and let it be a reminder to your customers of your organization’s potential.